This festival has been held since 1712. In order to pray for rain, people offer sake and lanterns to the gods. They also offer kasa-odori /hat dance. 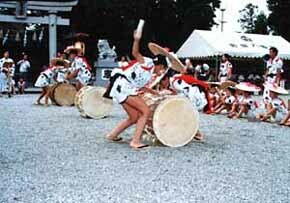 each side of the drums, and dance with amagoi songs playing the drums with short sticks called "tsutsuro". The actions of dancers while shell horns are playing, are quaint. Get off at Kariya or Higashi-Kariya station on the JR line.